China, already the world's leading emitter of human-caused greenhouse gases, continues to pump increasing amounts of climate-changing methane into the atmosphere despite tough new regulations on gas releases from its coal mines, a new Johns Hopkins study shows. The study's findings will be published Jan. 29 in Nature Communications. "Our study indicates that, at least in terms of methane emissions, China's government is 'talking the talk,' but has not been able to 'walk the walk,'" says Scot Miller, an assistant professor of environmental health and engineering at Johns Hopkins University and the study's first author. China is the world's largest producer and consumer of coal, with coal accounting for approximately 72 percent of the country's electricity generation. While data show that coal production increased in China, it has been unclear until now much methane gas, or CH4, has increased. Coal mine methane, or CH4 that is released during coal mining, is responsible for the majority of coal-related CH4 emissions and is likely the largest human-caused CH4 source in China. In an effort to reduce coal mine methane, China enacted regulations in 2010 requiring all mines to utilize all coal mine methane for electricity generation or heating, or flare it. Flaring converts the CH4 into carbon dioxide which does not warm the climate as effectively as CH4. 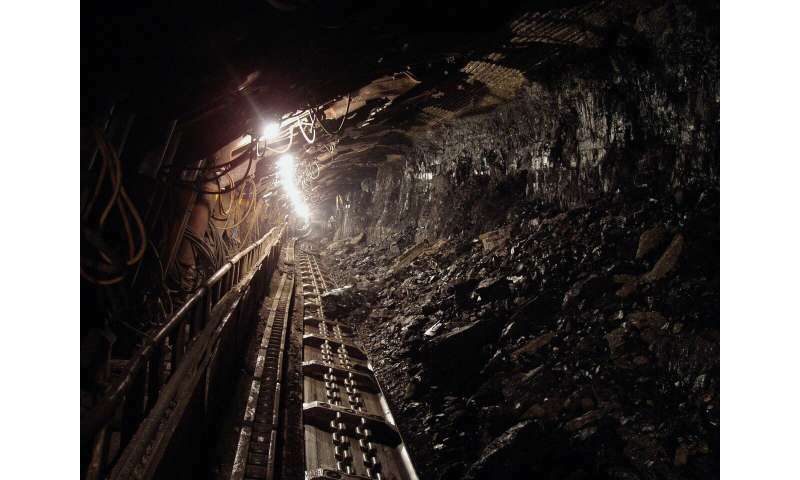 The country's 12th Five Year Plan, the communist government's strategy for economic and industrical development for 2011 through 2015, set a goal of using 8.4 billion cubic meters or 5.6 teragrams of coal mine methane by 2015. The plan also targets coal mine methane use of 20 billion cubic meters or 13.2 teragrams by 2020. For context, China's 2015 targets are equivalent to eliminating all methane emissions from a country like Australia or Canada, and the 2020 targets are more than twice that amount. To examine how China's methane emissions have trended from 2010 to 2015, the research team used data from the Greenhouse Gases Observing (GOSAT) satellite, a satellite launched by the Japan Aerospace Exploration Agency in 2009 that collects observations of atmospheric methane and carbon dioxide. GOSAT is one of the first satellites to measure methane and carbon dioxide with enough precision and accuracy to provide a robust view into greenhouse gas emissions at the Earth's surface. The satellite's nearly decade-long record of observations provides researchers with the opportunity to examine annual trends in greenhouse gas emissions across the globe. While other studies have used GOSAT data to focus on individual regions like India or on individual years, this is the first time the satellite's observations have been used to focus specifically on trends in China's methane emissions. The research team found that methane emissions rose by approximately 1.1 teragrams each year from 2010 to 2015 in China, resulting in about a 50 percent higher level of annual CH4 emissions by the end of the period; this increase is comparable to total emissions from countries like Russia or Brazil. Additionally, the researchers found that this increase from China accounts for 11 to 24 percent of the world's total increase. This increase is consistent with trends prior to China's 2010 policy implementations, which suggests that the country's regulations haven't been effective in slashing methane emissions. "China has received a lot of press coverage over the past few years for its efforts to enact greenhouse gas regulations and its efforts to become a leader on climate change, but the numbers show that China's methane regulations, in particular, have not had any detectable impact on their emissions," says Miller. Methane release is only going to get worse as peak oil begins, and drilling becomes frantic. Well, according to the newly elected Socialist-Democrat Party US Congresswoman A. Ocasio-Cortez everyone will have died in 12 more years (2030) due to AGW. So, perhaps the guilty party for causing the deaths of 6 billion humans and countless other life forms will be Red China and their methane emissions. Red China already has well over 1 billion people of their own - and that's a lot of methane emissions as it is. Right now it is wintertime in the northeast, midwest and other parts of the US where the temps are going down to ~60 degrees below and frostbite happens within ~5 minutes of exposed skin. Most of those folks in those areas of the US aren't complaining too much, as long as they have enough home-heating oil for their furnaces to keep warm indoors. See - you can complain all you want about drilling for oil in the summertime. But when it is 60 below in the wintertime and houses need to be heated or everything freezes - it is best to be aware of the human condition.